On Saturday, November eighth , the School Committee dedicated the lower football field with appropriate exercises and a football victory over the visiting Dartmouth High School team. A brief history of the field shows that in response to a request the Board of Selectmen of Middleboro, on September 20, 1939, granted a twenty year permit to the local School Committee to enclose, with the exclusive right and privilege to use, a portion of the premises leased to the town by the Trustees under the will of Thomas S. Peirce. Construction of the playing surface was started with NYA and student labor under the supervision of Mr. [Henry] Battis. An enclosing fence was made possible by the Trustees of the Peirce estate and all home games were played on the field during the season of 1940. During the summer of 1941 the field house was moved to the area from the hockey rink and will be developed for the serving of refreshments and the convenience of patrons at the games. Also during the summer of 1941, with some lumber from the old Union Street School, and some financial help from the Trustees, the bleachers on the west side of the field were constructed by Mr. Battis. A press box has been built above the top row of bleachers for the accommodation of the press and the operation of the public address system in assisting patrons in following the progress of the games. Future plans call for moving the present gridiron about six yards east and about ten yards toward the Nemasket River. Extensive filling on the visitor's side of the field will make ample room for more bleachers to be constructed later. When completed Middleboro High School can be proud of one of the finest football fields in our section of Massachusetts, made possible mainly through the effort of one individual, Henry E. Battis. At the dedication a flag pole and flag were presented by the Kiwanis Club and Mr. Battis was the recipient of a wrist watch from the student body and faculty of the school. These words of dedication, I believe, express the sentiment of the citizens of our town. "In appreciation of his devotion to his work with the youth of Middleboro, his efficient and enlarged program of Physical Education, his high standard of true sportsmanship, and his vision and untiring personal effort in planning and building the football field, the School Committee of Middleboro do this day dedicate this field as Battis Field." 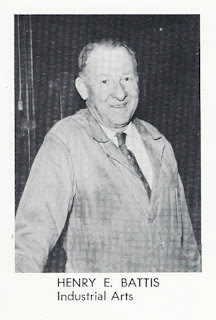 Battis (1907-83) joined the staff of Middleborough High School in 1933 as coach and teacher of physical training, later becoming Director of Athletics and a teacher of industrial arts. Battis retired in September, 1968. "Annual Report of the Superintendent of Schools" in Annual Report of the Town of Middleboro, Massachusetts, for the Year Ending December 31, 1941. Middleborough, MA: Town of Middleborough, 1942. Really enjoyed the article about Battis Field and my dad. To add to your information on the field I should explain some usually untold details. Please remember this is my recollection of my father's stories as I was not even born until 1942. Back in the 30's there was very little money for anything and schoolboy athletics was at the bottom of the list. My father was stuck in a terrible position since he was trying to run both phys. ed. and athletics with no money. Basketball was the only place where he could charge admission to help the almost nonexistent budget. He tried to charge admission to football games (played on the field across from the field house). There was a ticket on a string that he tried to get people to buy, but not too many did. He used those left over tickets to label hundreds of things over the next 25 years. This situation led to his idea of a new football field at the bottom of the hill across from the pool. As noted in your article land, fence, and material came from the community and a large portion of the labor came from the phys. ed. classes. He thought his dream had come true when they played the first games on the new field but to his consternation most of the spectators sat up on the hill and never paid admission. That is where the bleachers came from. Their function was not only to provide seating for the fans but to block the view from the hill. That's why they are so high. A friend in town told me about your article so I went to your web site for the first time. It's great. I can't wait to spend some more time there. Keep up the good work.